When should I visit the Walk-In Clinic? Click the “Show Availabilities” button, then select a convenient day and time. Fill out the “Patient Info” secure form. Please enter first and last name as it appears on your driver’s license or birth certificate. You must enter a valid phone number in order to verify your appointment via text message or automated call back. Enter your verification code on the Confirmation page. Your appointment is not verified until you enter your verification code on the form. If you do not immediately receive a text or call or have any questions, call (319) 483-1400. If you arrive 15 minutes or more late, your scheduled time will be forfeited. Walk-In Clinic appointments are for non-emergency illnesses or injuries. If your condition is an emergency, call 911 or visit your nearest emergency room. The Walk-In Clinic now has its own entrance on the west side of our building. 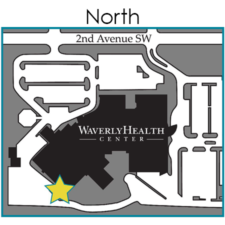 Please park in our west parking lot and use the Walk-In Clinic entrance.